In the starless void of intergalactic space, there are clouds of cosmic gas as old as the Milky Way. They produce no visible light, and they barely radiate heat. Now, for the first time, astronomers have determined their size. These shadowy structures are as big as galaxies. That’s according to Jeffrey Cooke of Swinburne University of Technology and John O’Meara of St. Michael’s College, who presented a new technique for determining the size of giant gas clouds at the 227th meeting of the American Astronomical Society this week. Their discovery is a big deal for cosmologists, who believe these fascinating structures play a key role in the evolution of the universe. “We think these are the cradles—the giant clouds that form a galaxy,” Cooke told Gizmodo. Now, we have our first hard evidence that the clouds are actually large enough to do so. Called damped Lyman alpha systems (DLAs), Cooke’s cosmic clouds were first discovered in the 1970s. They’re incredibly cold, and emit very little radiation of any kind. Until now, the only way to “see” one has been to get lucky and find an extremely bright quasar right behind it. By capturing the distorted light of quasars filtering through DLAs, astronomers have learned a lot about the composition of the clouds, which matches closely to galaxies born in the early universe. “We’ve known incredible detail about what they contain from quasar spectra,” Cooke said. They’ve got plenty of hydrogen, which makes stars, and some metals, which also hint at star formation. But we’ve learned next to nothing about their size. Imagine you’re trying to study an elephant, but your only source of light is a laser pointer. You might learn a lot about a tiny patch of that elephant’s skin, but you’ll have no idea how large it is. To size your massive subject, you need a much bigger light source. No, this isn’t Starkiller Base destroying the Earth. It’s an artist’s impression of the information obtained when imagining a distant object using two different light sources. A quasar (right center) produces a very narrow beam of light, while a spiral galaxy (right, surrounding the quasar) creates a much wider field of view. Image Credit: Adrian Malec and Marie Martig. That’s the exact situation Cooke and O’Meara found themselves in. 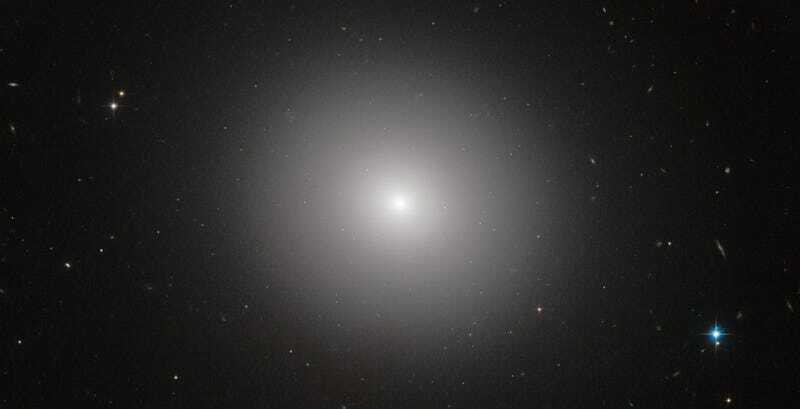 Lucky for them, there was another cosmic lightbulb that fit the bill: ancient galaxies. The astronomers selected a handful of previously-studied DLAs with bright galaxies in their backgrounds, and used one of the world’s largest telescopes—the KECK observatory at Mauna Kea, Hawaii—to image them in the ultraviolet. They validated their observations using another dataset on the same galaxies collected by the Very Large Telescope in Chile. Most of the DLAs we’ve found hail from the early universe, 10 to 11 billion years ago. Everything about them—their age, composition, density, frequency, and now, size, points to a single conclusion. We’re looking at galaxies that haven’t been born yet. Now that their technique has worked, Cooke and O’Meara plan use the Hubble Space Telescope to get an even better look at a few of their cloudy subjects.n“With Hubble, we’ll be able to do deeper and higher resolution imaging of the background galaxy, which gives better constraint on the size of the cloud,” Cooke explained. There’s a chance Hubble will even give us our first sharp images of the clouds themselves. Wonder what a hundred billion unborn stars look like? That’s what we’re hoping to find out.